Warehouse Product Slotting | To Slot or Not? Warehouse Product Slotting – To Slot or Not to Slot? Warehouse Slotting can reduce labour costs by up to 20%! Slotting is a warehouse term that refers to intentionally placing products within the warehouse storage medium to create warehouse efficiencies. Let’s consider what an essential aspect of good warehouse practise, product slotting benefits can achieve. The purpose of a warehouse is to provide storage of products to meet customer demands and inventory allows the decoupling of demand and supply. Often this inventory is used to smooth out the supply chain from disruptions (whatever they might be). Whilst there are variations to the operations of a warehouse; if we consider the direct labour component only, then products need to generally go through the following processes of receiving, put-away, storage, replenishment, picking, staging and dispatch of products to customers. 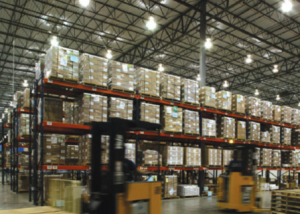 Of course some warehouses may skip some of these steps but for those that need to pick products and dispatch products to meet customer requirements, the location of products within the warehouse significantly affects the efficient warehouse operations. Vilfredo Federico Damaso Pareto was an Italian economist and the Pareto principal is named after him, he observed that 80% of Italy’s wealth belonged to only 20% of the population and since then it has been found many things in life are not distributed evenly. This is often the case with a portfolio of products that we store in our warehouses and sell to customers, usually a smaller percentage of the products (e.g. 20%) make up a greater percentage of what we sell (80%). So those faster moving products using this principle we can categorise as A, and so on, through B and to C the slower the sales rate is, we call this ABC analysis. Most warehouses within the Australian context at least, rely on receiving goods and transporting them with forklifts between the various operations. Direct Travel, is the travel from the receiving dock to put away and from the end of the pick assignment to dock, where we get maximum travel speed, distance travelled is two times the assignment. 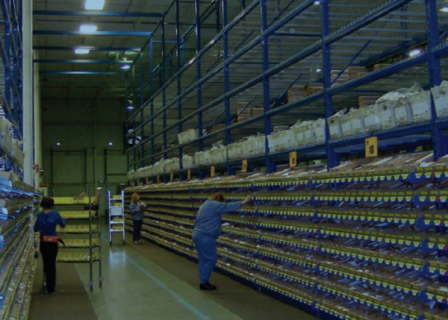 Preambulation, is travel within a picking medium, resulting in lower travel speeds, which is affected by the number of products being picked and impacted by the distance between product storage locations. The overall travel distance then is determined by the combined amount of direct and perambulation travel. Then for a given distance and at a given speed, by calculation we can determine the time taken for a specific warehouse operation. In better run warehouses these can be compared against engineered work standards for each task type and operators benchmarked against the work standards. Because travel is an activity, it is sometimes difficult to see the hidden waste within that activity; excessive pick travel might be occurring by not having products in the best position. This extra time can be related to direct labour costs as well as the increased picking time, measured by pick rate (units picked per standard person hour). Unfortunately at best, I have seen businesses just add more pickers when they need to get through the work and that adds costs or even worse, missing customer service targets. Also when products are not in the right location and potentially not in the right quantities, even extra wait time is introduced while pickers are waiting on replenishment of the pick face, this results in extra touches of the product. Product damage is another symptom, although most experienced operators can avoid this. Another symptom slotting can resolve, is lack of warehouse capacity. Let’s face it we usually keep adding products to the range for sale and they all take more and more locations to store this extra stock. Slotting can consider the amount of cube required and inexpensively often add smaller slots more appropriate for the product stocking requirements. All of these symptoms potentially are a sign that a slotting exercise is overdue. There are various forms of slotting approaches; macro slotting or profiling are about overall warehouse layout, whereas micro slotting is the detailed placement of product along the pick path relative to the final destination or rally point. To do this analysis, considerations of the product characteristics such as product velocity, dimensions, cube, crushability, toxicity etc. need to be factored into the constraints, along with specific picking strategies that will be unique to your warehouse. Examples include discrete pick (as assignment per order), consolidated orders, often used when discrete picking happens at the customer venue, and so on. 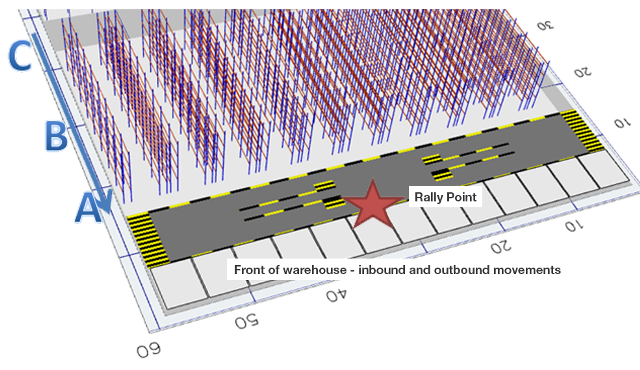 The storage medium and its specific relationship to the rally point, often a staging area prior to dispatch and finally developing the rules by which to slot specific products to specific locations. Simply put, we are looking to place products in the right location so as to minimise to distance travelled whilst ensuring other constraints are observed. So placing faster moving products closer to the rally point, results in less distance travelled’ less labour time, and hence cost savings. So using ABC analysis we would then place the A products close to rally point and progressively the B and C products further away, thus reducing travel distance. Figure 1 illustrates this product placement. Product slotting means savings in direct labour, more capable picking capacity and possibly better warehouse utilisation and reduced product damage, who wouldn’t want all that, so what’s the catch? So what are the trade-offs, as often we have to trade off cost with service. Well I’ll let you in on a pleasant surprise, this is one of the few cost saving ideas that you can implement in your current facility whilst making no changes to infrastructure, although there may be further benefits to do that. You can achieve the benefits, by simply rearranging products, within existing storage media, to reduce travel distance and hence resolve some of the symptoms described earlier. For those prudent enough to undertake such an exercise, cost savings are usually between 10% to 20% of direct labour. Remember the old adage; if you fail to plan, you plan to fail. All too often in our busy work lives there is always something urgent to occupy our days. When we walk through the warehouse there is always plenty of activity, but because this is hidden waste you have to look hard for the symptoms. Talk to your team about product placement within locations, see what they have done in reviewing slotting, ask to see their plan. Oh, and while you could re-slot the whole warehouse, some operators just do it through the pick face replenishment process and maintain the operation through movements that were required in any case. Warehouse managers should have a product location maintenance plan to ensure they are actively managing the product placement within their warehouse. This will ensure that consideration for product placement can happen, particularly during times of change such as the introduction of new products or changes in sales product mix. In any case go for a walk and have a look at your operations and see if you can find the hidden waste, maybe have a look where some fast moving products are located and determine if they could be closer to the facility centre of gravity. So, to slot or not to slot? What will you do? This article is the first in a planned series on slotting. In the next article we’ll cover the steps involved in slotting and some of the considerations. John Monck, is a supply chain professional at Logistics Bureau, with degrees in engineering and economics. Having worked in many roles across supply chain, he has a particular disgust of waste and inefficiency and see’s it as his personal mission in life to reduce them both! If you want some help in slotting your warehouse, John uses some very smart software tools that can quickly undertake the whole slotting exercise. Maybe to get you that 10-20% of labour cost savings sooner than you think? A very insightful article, no doubt drawn from years of experience within Supply Chain. Reduction of waste is the key. Glad you enjoyed it. Product Slotting in Warehouses is not that well understood yet, but can deliver great benefits.